>>hey Tom, glad to see you hanging around the Iguana forums. Just had to tell you that I've placed 4 Rhino iguanas in the last several years, all of them nice males. Three of them came to me as rescues of sorts, the 4th was one that I purchased as a yearling hoping it was female and it was a male. I ended up keeping another female that came in as a rescue with a large group of nice animals. We will eventually find Beth a Rhino if that is what she wants. Maybe, if I get fertile eggs this year, I'll incubate just one for her. I'm sure she'd love a Bubbles baby. Actually I have had several Spiny Tailed iguanas in my rescue as well. 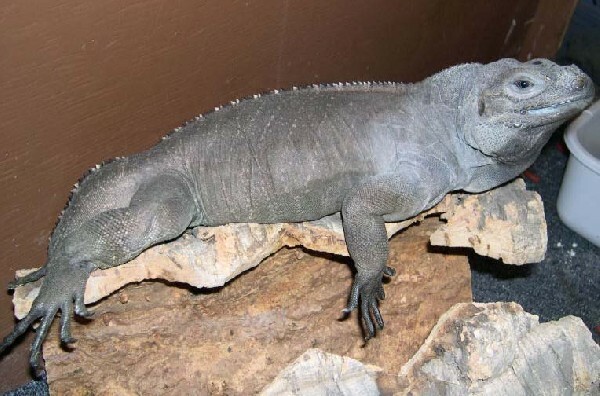 I have adopted 2 cyclura as well as a lovely spiny tailed. Things are possible to those with patience. The pic is one of my adoptions.